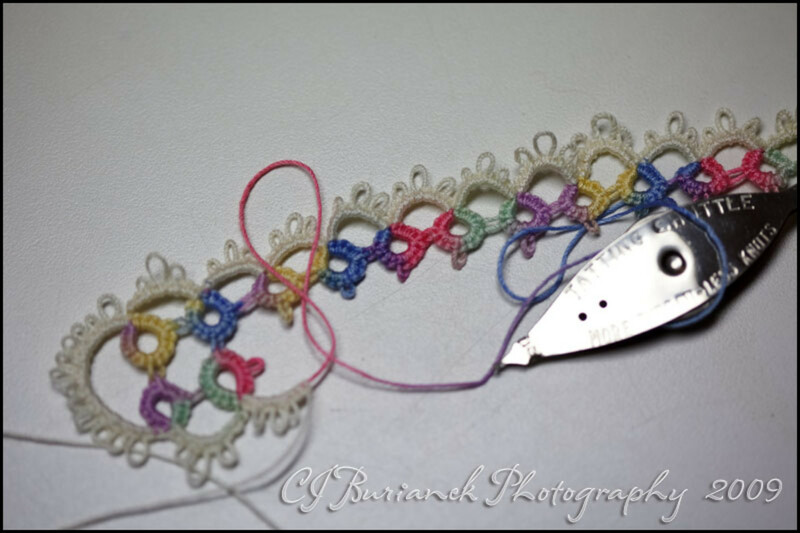 Bernat Handicrafter cotton is my favorite yarn to use for crocheting up dishcloths. It is a natural 100% cotton yarn, which is not only safe to use on the dishes, but it also acts as a natural scrubber. After several uses, the yarn becomes super soft and absorbent, which makes it the perfect yarn for crocheting all kind of kitchen items, including dishcloths, towels, placemats, coasters and aprons. 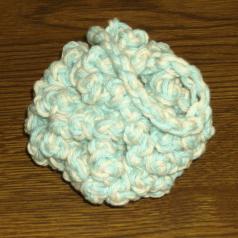 Bath scrubbies and wash cloths also work well with this yarn. Since it is a cotton yarn, you can also use it to make baby blankets, baby clothes, bibs, and other baby accessories. I have also used this yarn to make bags, and am planning on using it for making a yoga mat later on this year. From my experience so far, I believe the yarn will help to provide a good grip for the hands and feet during the yoga postures. But I’ll have to wait and see how well it works. 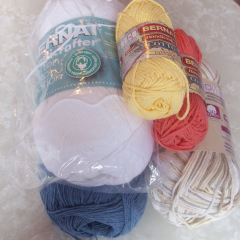 Another great thing about Bernat Handicrafter, is that it is available in both large and small balls. This is great because then you don’t have to buy a big ball if you are only going to be making a small dishcloth. 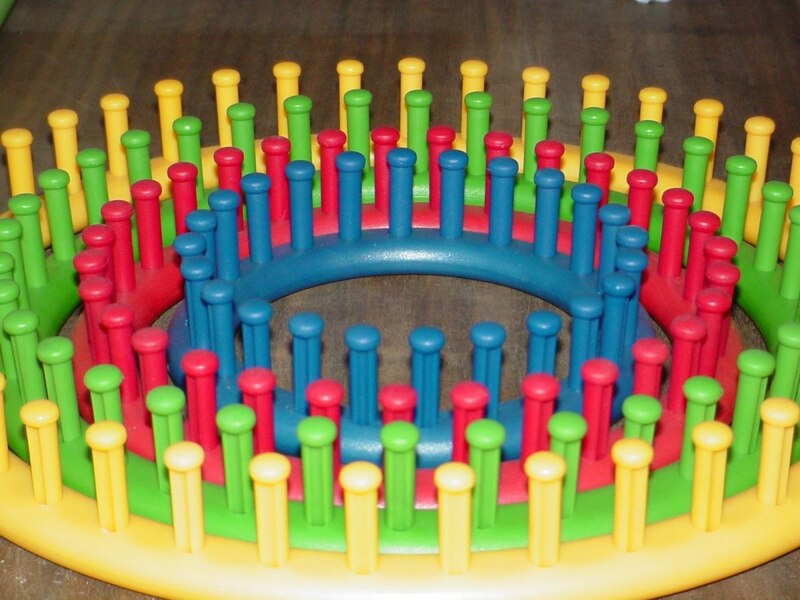 In addition, you can get the yarn in solid or multi colored balls. There are different variations of this yarn, which include “Cotton Stripes,” “Cotton Scents,” “Cotton Twists,” UltraSoft” and “Peace and Love.” As much as I love Handicrafter yarns, I have not yet tried out the “Stripes,” “Twists,” or the “Scents.” The “Scents” sound like a therapeutic yarn as they release a scent while it is being worked. The biggest downfall of this yarn is that it fuzzes up a lot during washing. However, after a few washes, a lot of the fuzzies seem to disappear, and you end up with a beautiful fabric. Another downfall, which is normal for any cotton material, is that it shrinks a lot if you leave it in the dryer at a high temperature for too long. Care Instructions: Care instructions vary from each type of yarn. But in general they are machine washable and dryable. Bleach is not recommended. Available Colors: There are a huge number of colors available, which include both solids and variegated yarns. Net Weight per Ball: Small Balls are about 1.75oz/50g and the large ones are 12oz/240g. Available At: Walmart, Amazon and other online stores. A collection of free kitchen crochet patterns. 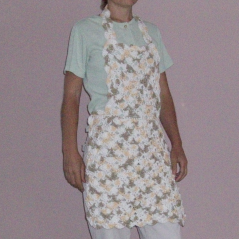 The crochet pattern collection includes aprons, dish cloths, scrubbies and more. 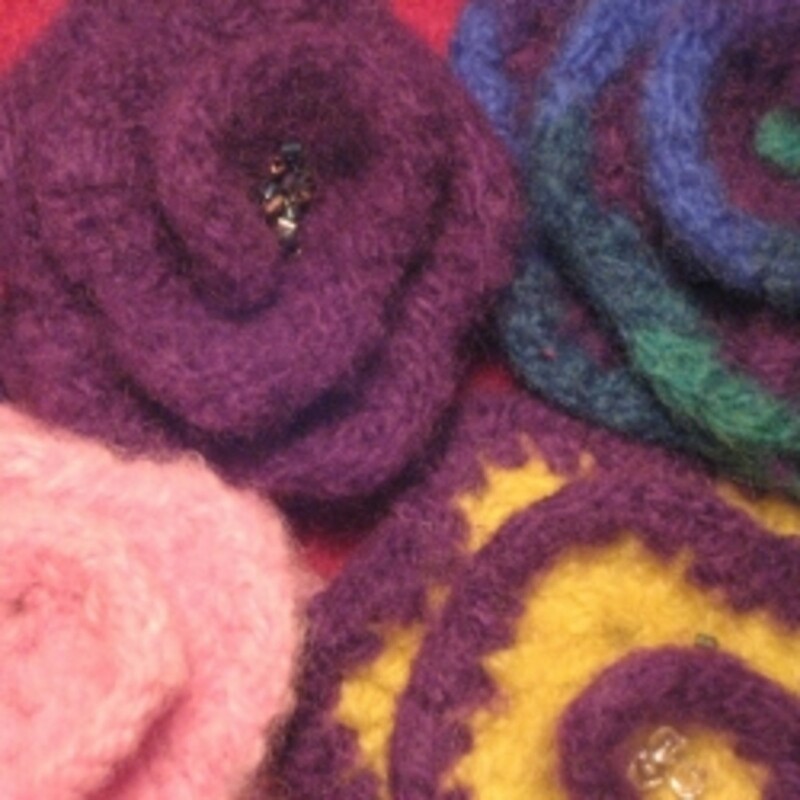 A collection of free crochet patterns designed by indie crochet designers. 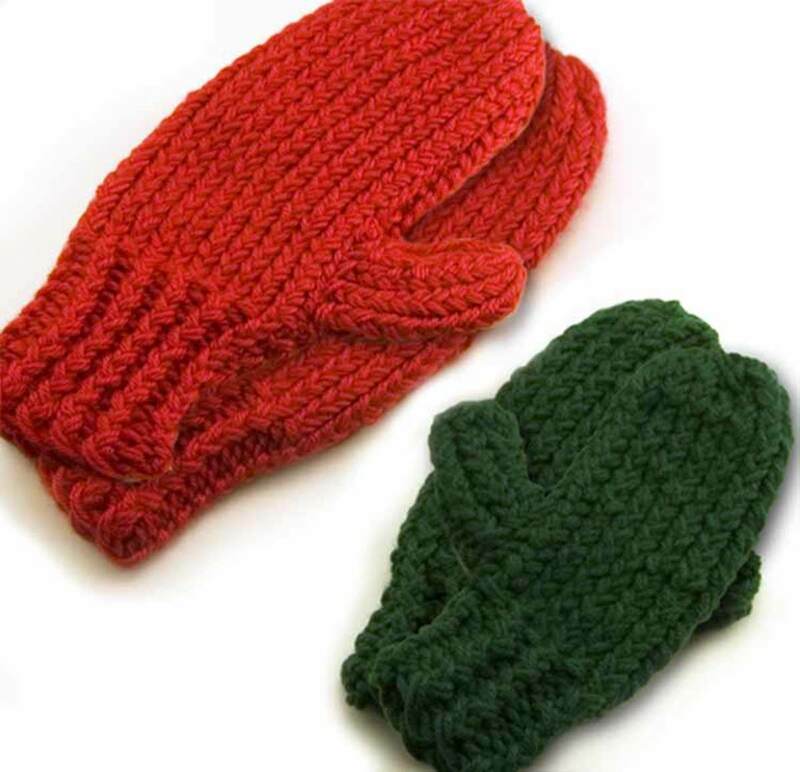 20 free crochet dishcloth patterns are on this page. 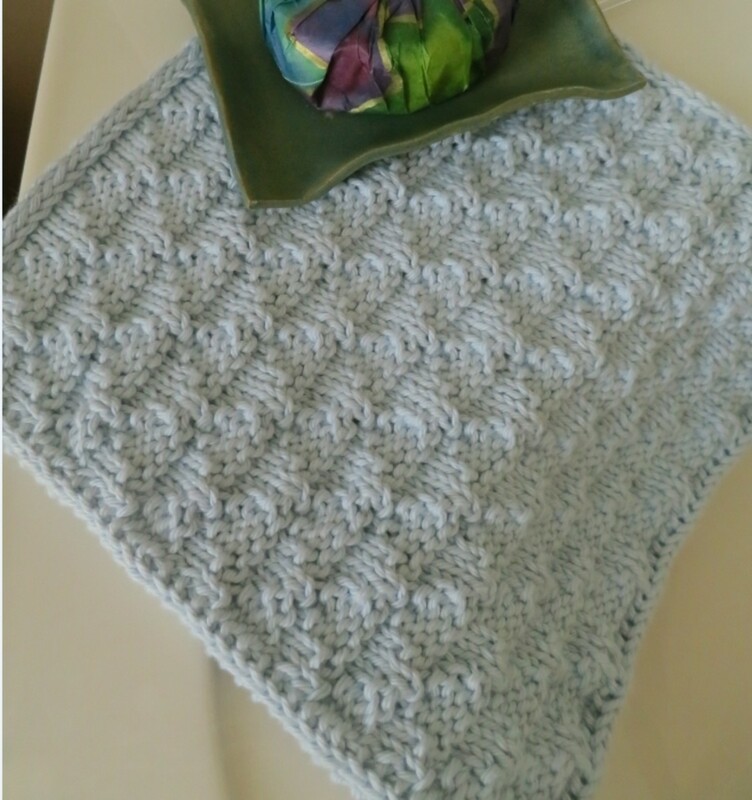 Dishcloth are quick and easy to crochet and make great gifts. Kschimmel, I always wondered if there was a difference between the yarn. I think I bought Sugar and Cream once, but can't remember how it turned out. But it was more expensive and so I never bought it again. Thanks for letting me about the difference. PWalker, I never had the chance to try peaches and cream, but if you miss it, then it must have been a nice yarn. If you have a chance to try Bernat, I would love your opinion on it. Thanks again for the vote! I'll have to try this yarn. When Peaches and Cream, a very nice cotton yarn, was bought by Lily's Sugar and Cream, I was sad to see the yarn disappear. But looks like there are alternatives to try. Thanks for sharing. Rated up and useful! I had used Sugar'n Cream for years, but then found some Bernat on sale. The Bernat cotton made a much softer dishcloth--in fact, I made a bigger dish towel with it for drying dishes. Craftdrawer, yes I agree. Not all yarns work for all projects. Thanks for stopping by. 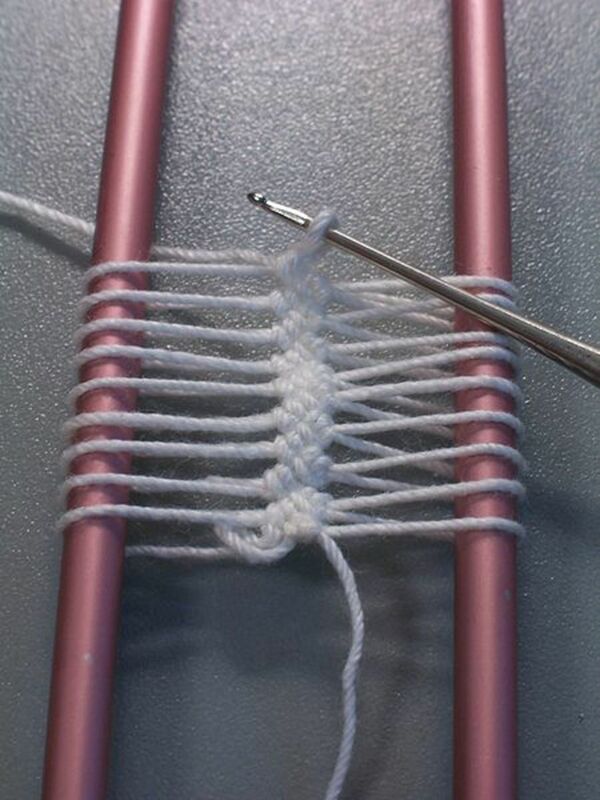 Great review....It's nice to know what yarn to use when crocheting..